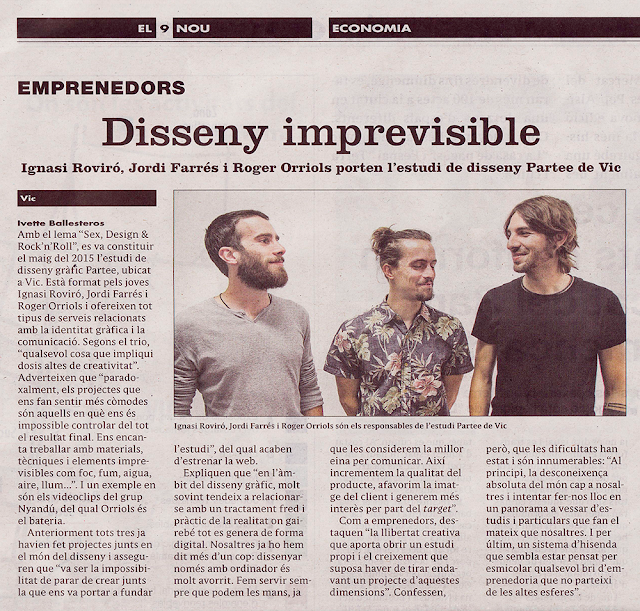 Partee is a collective formed by the graphic designers Roger Orriols, Ignasi Roviró and Jordi Farrés. Partee is the celebration of the creative process. Badabum sisters & Ferran Orriols (Nyandú) are in the house! Avui hem anat a veure la gent de Vanguard Gràfic, responsables de les impressions per el FIU BCN 2016. Ens hi han acompanyat els companys d' Aplauso. Gràcies per la visita guiada, Josep! Today we've visited the people of Vanguard Gràfic, responsible of the FIU BCN 2016 printings. Aplauso fellows have joined us. Thank you for the guided visit, Josep! El FIU Barcelona -sense el qual no seriem on som- ens dedica aquesta preciositat d'article. Gràcies de tot cor! FIU BCN -without which we would not be where we are today- give us this beautiful article. Thank you so much!